An international research team, led by Dr. Ruobing Dong at University of Arizona in USA and in Academia Sinica Institute of Astronomy and Astrophysics (ASIAA) in Taiwan, has discovered the tale-telling signs of planets in the young, likely planet-forming disk around the star MWC 758. Obtained with the Atacama Large Millimeter and submillimeter Array (ALMA), the “ultra” high resolution image revealed the disk having not only an off-centered cavity but also a spiral arm corresponding to one previously seen in reflected light. ALMA image of the 0.87 mm continuum emission from the MWC 758 disk. High resolution observation with ALMA shows various structures: elliptical cavity, dust clumps, rings, and a spiral arm. 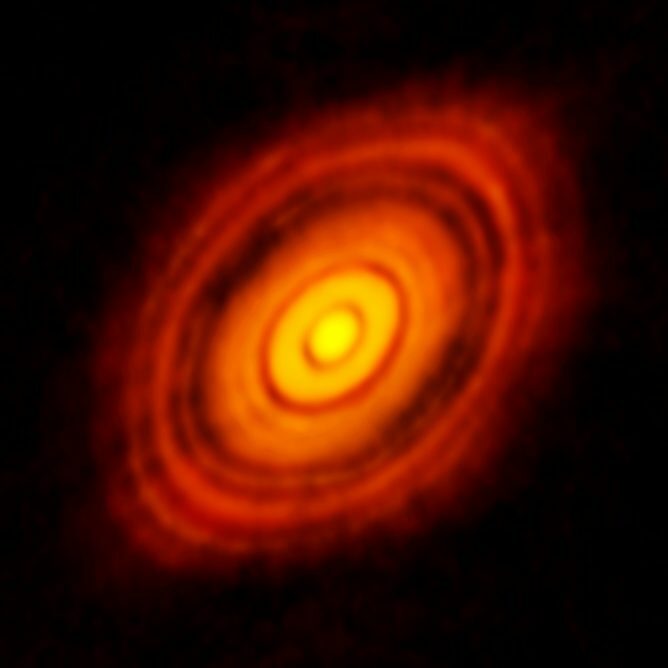 Credit: ALMA (ESO/NAOJ/NRAO), Dong et al. 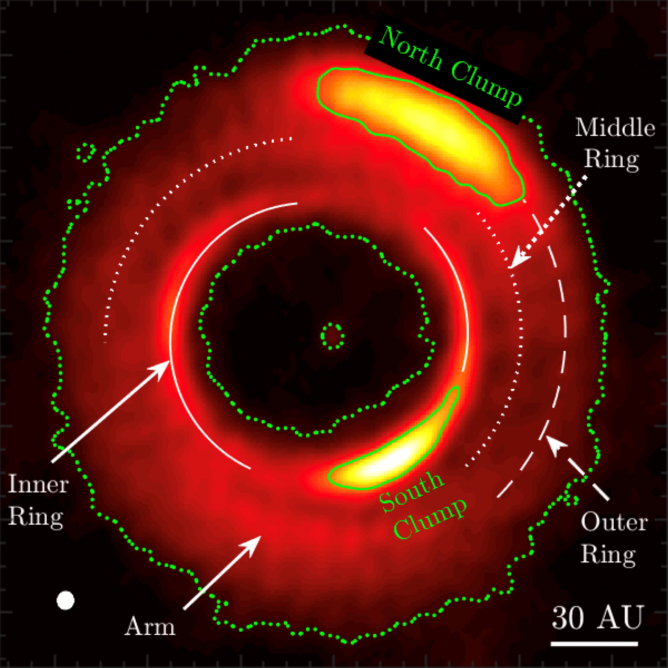 Since the early 2000, rich structures, including gaps and rings, dust clumps, and spiral arm-like features, have been discovered in a few tens of disks surrounding newborn stars. With the belief that planets are forming inside, astronomers named these disks “protoplanetary disks”. The origin of these structures is in hot debate among astronomers. In one scenario, they are thought to be produced by unseen planets forming inside and gravitationally interacting with the host disks, as planets open gaps, shepherd dust clumps, and excite spiral arms. Alternative ways to produce observed disk structures that do not invoke planets have also been raised. For examples, large central cavities may be the outcome of photoevaporation, as high energy radiations from the central star evaporate the inner disk. Also, under certain conditions shadows in disks may mimic the spiral arms seen in reflected light. The protoplanetary disk around a young star MWC 758 is located at 500 light years from us. In 2012, a pair of near symmetric giant spiral arms was discovered in reflected light. In dust thermal and molecular gas line emission at millimeter wavelengths, a big inner hole and two major dust clumps have been found, too. Now with the new ALMA image, the previously known cavity of MWC 758 is shown to be off-centered from the star with its shape well described by an ellipse with one focus on the star. Also, a millimeter dust emission feature corresponds nicely with one of the two spiral arms previously seen in reflected light. Both discoveries are the first among protoplanetary disks. Previously in 2015, Dr. Dong and his collaborators proposed that the two arms in the MWC 758 disk can be explained as driven by a super-Jupiter planet just outside the disk. The off-centered cavity strongly, on the other hand, disfavors alternative explanations such as photoevaporation, which do not have an azimuthal dependence. The fact that the south spiral arm is present in the millimeter emission tracing the dust rules that the arm is a density arm. Other scenarios, such as shadows, which view the spiral arms as surface features, are not expected to reproduce the observations. The ultra-high resolution achieved in the new ALMA dataset also enables the detection of a slight offset between the arm locations in reflected light and in dust emission, which is consistent with models of planet-induced density wave. This research was presented in a paper “The Eccentric Cavity, Triple Rings, Two-Armed Spirals, and Double Clumps of the MWC 758 Disk” by Dong et al. to appear in the Astrophysical Journal.